Glashütte Original represents German watchmaking of the highest quality. This watch manufacturer blends classic style with modern design. Finely finished in-house calibers, intricate complications, and precious materials define these watches. Glashütte Original is a name that has represented traditional German watchmaking of the highest quality for over 100 years. Glashütte Uhrenbetrieb GmbH, the company behind this brand, is a member of the Swatch Group. It continues the tradition started by Ferdinand Adolph Lange in the small Saxon town of Glashütte in the mid-19th century. Fans of high-quality mechanical timepieces with timeless classic designs are Glashütte Original's target audience. In-house calibers power almost every watch. Some are even outfitted with complications like a tourbillon, perpetual calendar, or flyback chronograph. As is the case with most Glashütte watches, these refined movements feature only the finest stripes, perlage, and engravings. They are made in the company's own dial factory in Pforzheim. When it comes to the cases, Glashütte Original mostly uses platinum, red gold, or white gold. However, they do work with stainless steel from time to time. This luxury watch manufacturer's comprehensive catalog also includes watches with a sporty character and those with a retro feel. These watches speak to a more youthful audience that values modern design and premium quality. What's more, Glashütte Original also has an entire collection dedicated to women's watches. 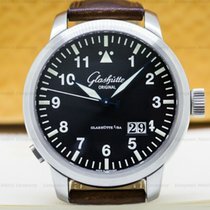 How much does a watch from Glashütte Original cost? The Senator collection is rather classic and traditional branch of the Glashütte Original catalog. The top model is the Senator Grande Cosmopolite Tourbillon . This 48-mm platinum watch is the manufacturer's most complicated by far. The manual caliber 89-01 provides it with a perpetual calendar and second time zone. Its namesake flying tourbillon sits at 12 o'clock. This timepiece is limited to a run of 25 pieces and is therefore difficult to find. Prices for this technological masterpiece come in at around 371,000 USD. However, there are also more affordable models. For example, the Senator Tourbillon features the same flying tourbillon, but doesn't have a second time zone or perpetual calendar. Expect to pay between 59,000 and 84,500 USD for this white gold timepiece depending on its condition. Frequent travelers will enjoy the Senator Cosmopolite powered by the automatic caliber 89-02. Like its big sister, this watch also has a subdial that displays the time in a second time zone. This timepiece is available in white or red gold and demands around 29,500 USD. The Senator collection also contains a wide array of three-hand models. You can choose models with or without a date, as well as those with a moon phase indicator, programmable alarm, or perpetual calendar. When it comes to the case, your options are gold or stainless steel. Older models with no complications sell for as little as 7,600 USD. Current models with a perpetual calendar can cost up to 28,500 USD. If you'd prefer a chronograph, the Senator collection has plenty to choose from. The Senator Chronograph Panorama Date puts a sporty spin on this classic design. This flyback chronograph with a distinctive panorama date at 6 o'clock is available in stainless steel or red gold with your choice of a leather, rubber, or steel band. The eye-catching dial comes in silvery white or deep black. Prices for this model range from 10,500 USD for a pre-owned piece to 17,500 USD for a new one. The Capital Edition is almost identical to the Senator Chronograph except for its dial, which has a shimmery sunburst pattern. The subdials are outlined in a ring of contrasting color and also feature a sunburst. Set aside around 16,000 USD for the stainless steel version. Gold models change hands for around 33,000 USD, while platinum pieces demand about 62,500 USD. The Pano collection combines traditional design with contemporary elegance. Asymmetrical displays and a panorama date characterize this series. 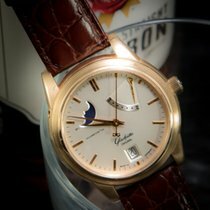 The PanoMaticLunar is the most famous model and features a small seconds dial, panorama date, and moon phase indicator. The steel version of this automatic watch costs about 9,100 USD. At around 17,000 USD, the gold edition is almost twice as expensive. The PanoReserve sells for similar prices and has a power reserve indicator in place of the moon phase. The PanoMaticInverse is especially striking. It offers a view of the duplex swan-neck fine adjustment from above. Usually, this component can only be viewed through a case back. This butterfly-like feature made of gold, rubies, and tempered screws dominates the appearance of this watch. A stainless steel PanoMaticInverse sells for around 10,500 USD. Prices for red gold models climb to some 21,000 USD. The collection's two chronographs, the PanoMaticCounter XL and PanoGraph, are just as exceptional. The PanoMaticCounter XL comes with a rather rare complication, namely a double-digit counter. Two push-pieces allow you to add or subtract from the number on the counter, while a third push-piece resets it to zero. In addition, the PanoMaticCounter XL also features a flyback chronograph. This stainless steel watch costs around 18,000 USD new. Then there's the Panograph, which boasts a sectoral 30-minute counter in addition to a flyback function. This special counter sits between 2 and 3 o'clock. In mint condition, this extraordinary red gold chronograph demands about 24,500 USD. The Vintage collection is geared toward lovers of watches with retro designs. Spezimatic watches produced in former East Germany served as the template for the colorful Sixties collection. The dials pop in silvery white, graphite black, shimmering blue, deep green, or a bright reddish-orange. Glashütte Original crafts this simple three-hand watch in gold or stainless steel, with or without a panorama date. Prices for a Sixties in red gold with a date display come in at around 13,500 USD. Without a date display, that price drops to about 10,000 USD. The stainless steel versions are markedly more affordable, ranging from 5,300 USD without a date to 6,700 USD with a date display. The Sixties Chronograph takes its inspiration from motorsport. In addition to the hour and minute hands, a stop-seconds hand rotates against a black or white background. What's more, this timepiece also features a small seconds dial at 3 o'clock and a 30-minute counter at 9. You can call this elegantly simple stopwatch your own for about 6,600 USD. The Seventies series also belongs to the Vintage collection. A square stainless steel case defines these watches. Once again, you can choose from a three-hand model with a date (Seventies Panorama Date) or a chronograph with a flyback function (Seventies Chronograph Panorama Date). Both versions are available with a white, gray, or sunburst blue dial. If you're interested in the chronograph Seventies model, plan to spend between 10,000 and 12,500 USD. The three-hand model with a date display costs around 7,200 USD. The Pavonina, Lady Serenade, and PanoMatic Luna models make up Glashütte Original's Ladies collection. There are many variations of the Pavonina available. The stainless steel, bicolor, or red gold cases are paired with either a metal bracelet or leather strap. Many versions of these rounded, 31 x 31-mm cases even feature diamond embellishments. The Pavonina is the only Glashütte Original collection to feature quartz movements, which helps keep the prices relatively low. For example, you can purchase a stainless steel Pavonina for as little as 3,400 USD. Prices begin around 10,000 USD for red gold models and 12,500 USD for diamond-studded watches. You can also find diamonds adorning the bezels of watches in the Lady Serenade series. The round case of the Lady Serenade is 36 mm in diameter and houses the automatic caliber 39. In terms of material, your choices are stainless steel or red gold. Expect prices ranging from 5,100 USD for a simple stainless steel model to 14,000 USD for a gold watch with diamonds. The PanoMatic Luna comes with a number of complications. The automatic caliber 90-12 provides it with a stop-seconds mechanism, panorama date, and moon phase indicator in addition to the standard time display. The PanoMatic Luna is also available with diamonds. At 39.4 mm, its case is a bit larger than that of the Pavonina and Lady Serenade. It also costs more than its sister models. Plan to spend around 14,500 USD on this timepiece. There is so much more to Glashütte Original's history than just a founding date. Their origins date back to 1845 when Ferdinand Adolph Lange founded the first watchmaking shop in the small German town of Glashütte. He was later joined as other shops began taking up residence there. Glashütte soon gained a reputation well beyond German borders for producing first-rate watches. Production in Glashütte was seen as a sign of high quality and served as an attractive selling point. Later, the Norwegian polar explorer Roald Amundsen relied on special Glashütte watches for navigation. One such watch is now on display at the museum dedicated to Norwegian polar exploration in Oslo, the Frammuseet (Fram Museum). In 1916, Karl W. Höhnel marked one of his pendulum clocks with the words "Original Glashütte." Later, in 1927, the words appeared printed on the dial of a wristwatch for the first time. After the end of the Second World War and the founding of the German Democratic Republic in the early 1950s, the Glashütte companies were forced to merge and nationalize under the name VEB Glashütter Uhrenbetriebe (GUB). The GUB was state-owned and produced products for East Germany as well as for export. After the fall of the Berlin Wall in 1990, the Glashütter Uhrenbetrieb GmbH emerged as the successor to the GUB. Beginning in 1994, the new owners, Alfred Wallner and Heinz W. Pfeifer, began moving the company's focus in the direction of luxury watches. In 2000, the Swiss concern Swatch Group took over Glashütter Uhrenbetrieb GmbH.